Goats May Be Unwelcome In Zimbabwe's Capital, But D.C. 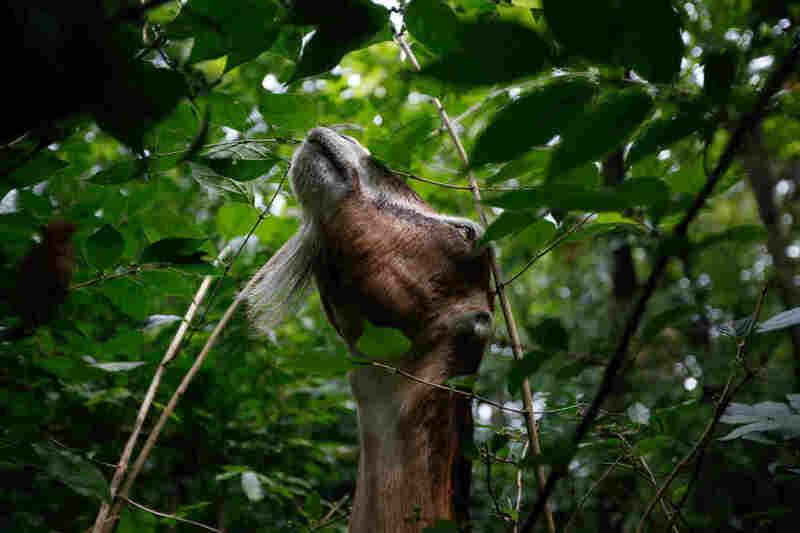 Loves Them : Goats and Soda Whiskey, Peanut and Nadia the Wonder Goat are currently removing weeds in Congressional Cemetery. Peanut, age 5, prepares for an afternoon of eating the leaves of the invasive honeysuckle. Why Did Robert Mugabe Ban Goats From A City Where There Are No Goats? On the same week that President Robert Mugabe made it clear that goats are not welcome in the streets of Zimbabwe's capital, a herd of goats got a hero's welcome in the capital of the free world. "Mommy, I see the goats! Look at the goats!" squealed a little girl who'd just bounded past the final resting spot of J. Edgar Hoover at the Congressional Cemetery in search of the ruminants. The historic graveyard in Southeast D.C. has gone all out for the arrival of the herd. Signs throughout the cemetery point to where 30 goats are nonchalantly clearing brush. The gift shop overflows with goat-themed souvenirs, including cuddly stuffed bucks and a crinkly goat-shaped cat toy. The president of the cemetery, Paul Williams, says the grazing goats are a win-win-win. 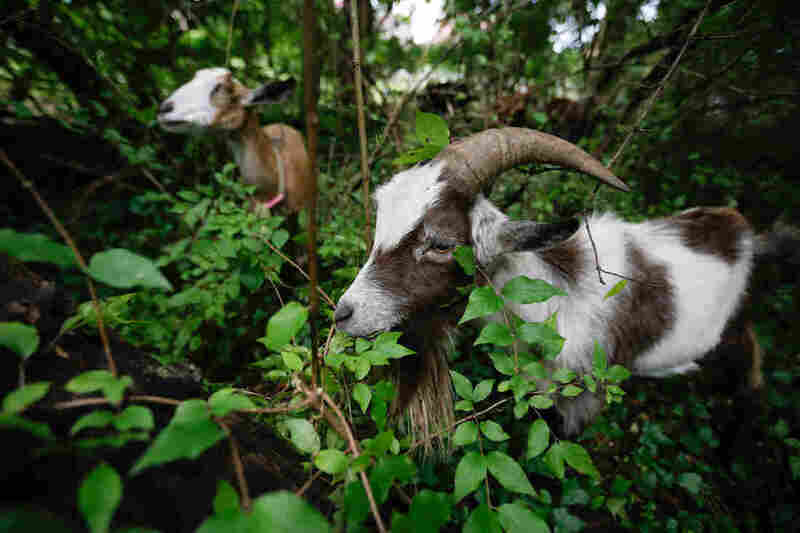 Mimsy, age 2, in the foreground, munches on invasive foliage at Congressional Cemetery in southeast Washington, D.C.
"We get our land cleared, we get it fertilized, and the goats attract thousands of people. A lot of families with kids are coming into the cemetery and often seeing a goat for the first time," he says. The cemetery is also throwing a cocktail reception called "Return of the Goats Happy Hour" with Nadia the Wonder Goat in an underground mausoleum. Mugabe, of course, will not be attending. He's banned from entering the U.S.; the State Department imposed the travel restrictions against him in 2002 over allegations of rigging elections and torturing political opponents. Plus, he's not a fan of goats. "We do not want ... the sort of mayhem in other countries where you see goats in the city center," he said in his anti-goat manifesto last month. The goats at Congressional Cemetery in D.C. showed no signs of inciting mayhem. They casually chewed leaves and underbrush in a thickly wooded part of the graveyard grounds just past "Babyland" (a section where dozens of infants were buried in the 19th century) that abuts the Anacostia River. Cemetery president Williams says the goats have been munching on invasive species. "Those vines are strangling a lot of our mature trees, then those trees tend to die and knock over our headstones," he says. Penny, age 3, reaches for some high-altitude leaves in the overgrown border of the cemetery. In addition to saving the headstones, Nadia the Wonder Goat, Whiskey, Peanut and the rest of the herd are feasting on poison ivy. Some of the goats are more interested in schmoozing with visitors than in eating weeds. 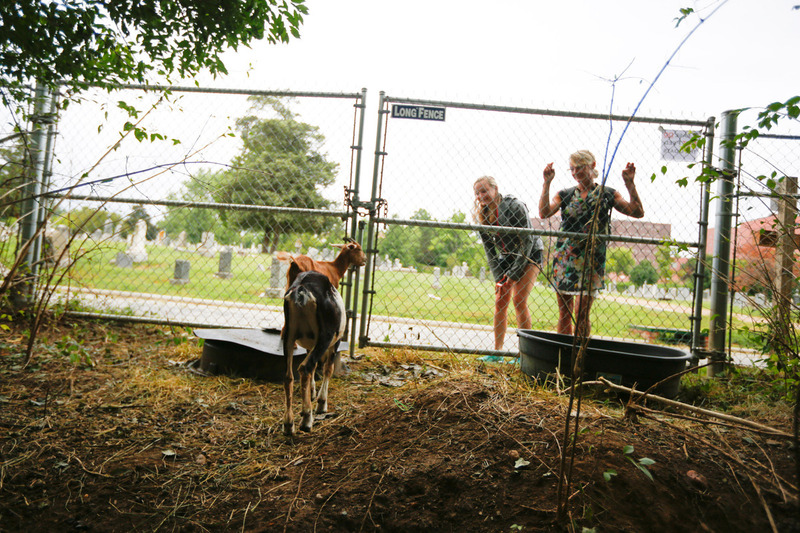 Over 1,000 people have come to see the goats since they started work at the cemetery Thursday. At the same time that President Mugabe wants to keep goats off the streets of Harare, people in the U.S. capital are paying thousands to bring in herds like this one. The cost of hiring a herd of 30 to 35 grazing goats for two weeks is $4,500. An anonymous donor is footing the bill for Congressional Cemetery. That's about three times the average Zimbabwean's annual income. Meanwhile, goats can play a role in Zimbabwe's economy, too. 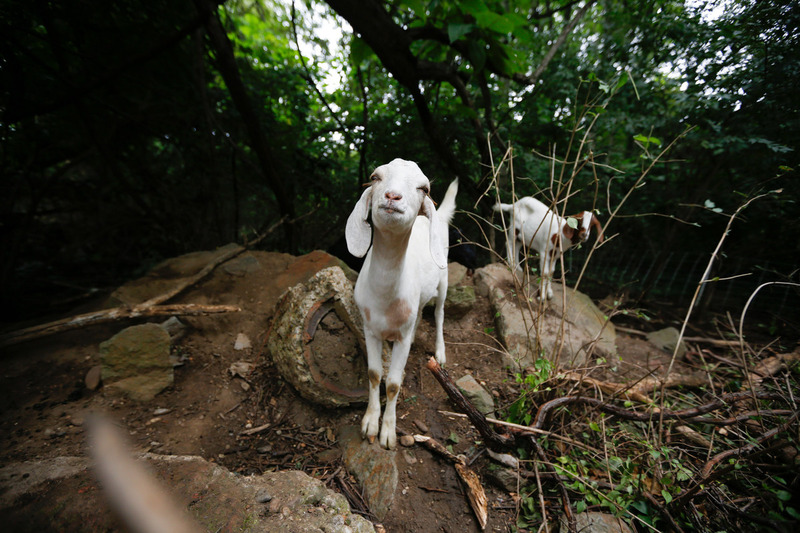 While there's probably not a big market for brush-clearing herds, agricultural experts are pushing to raise more goats as an alternative to cattle. In dry parts of Zimbabwe, cattle are expiring but goats are thriving.